A nuts and bolts introduction to the game of crown green bowls including technical aspects of the equipment used and the green on which it is played. The green is square, varying in size from 30 yards to 60 yards. The surface of the green slopes slightly upwards, rising to a central crown between 6 and 12 inches higher than the edges. The surface of the green tends to be irregular, unlike the level surface of the rink green. The crown and the surface irregularities provide fresh factors to influence the running bowls. The entrance to the green which must be near the middle of one of the sides. A 4 yards distance from the edge of the green, indicated by pegs at the four corners of the green. Each player in the game uses two bowls. The quality, size, weight and bias of the bowls are as important to the player in the crown green game as in the level green game. There are no restrictions on size, weight and bias; the player has, therefore, a greater choice of bowls. The height of the crown and the undulations on the surfaces of different greens exhibit large variations. In general, a higher crowned green requires a more heavily biased bowl than a smaller crowned green. Many players find it an advantage to have two or three sets of bowls, differently biased, and they use the most suitable to the green upon which the game is being played. The jack corresponds in shape and bias with the bowls but it is much smaller. The delivery of the jack is an important part of the game – as it runs over the green it responds to the surface and to its own bias. The player can gain much information about the irregularities and the shape of the green by watching the jack. 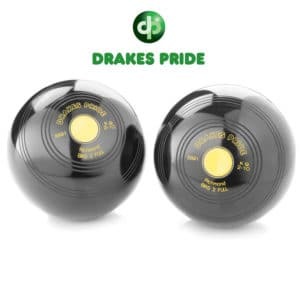 In competitions only jacks approved by the British Crown Green Bowling Association may be used. The footer is a small mat on which the player must place a foot during the delivery of each bowl. At all times during the delivery, player’s toes must be in contact with the mat. The size of the footer varies – there is no regulation on the point except in the professional game, when it must not exceed 4 inches in width. Both the bias and the slope of the green cause the bowls to run in curved paths. The bias on a particular bowl remains unchanged; the slope of the green varies with each shot, since two shots are rarely played over the same path. The green will always tend to pull the bowl in the direction of the downward slope. As the bias can be transferred from one side of the bowl to the other at the discretion of the player, the two effects of bias and green can be used together, widely curving the path of the bowl; or against one another when the path of the bowl will be less curved and may run almost straight. Almost straight, but never quite straight, for in the last foot or so before the bowl stops, the pull of the bias at low speed will usually be much greater than the pull of the green, and the bowl will curve around in response to the bias. In a straight peg shot, the slope of the green and the bias of the wood are used in opposition to one another and the bowl follows a path which can be almost straight. In a round peg shot, the slope of the green and the bias are used together to increase the curvature of the path of the bowl. The player must place and keep his toe on the footer while delivering a bowl on the jack, the toe remaining in contact with the foot until the wood has left his hand. A player bowling the jack with is right hand must deliver his bowls with the right hand and have his right toes on the footer. He must continue to bowl with his right hand throughout the game. Similarly, a player bowling the jack with his left hand must deliver his bowls and continue throughout the game with his left hand, his left toes being on the footer. The only exception allowed to this rule is for the player who suffers a disability of a limb and for whom it would be physically impossible to observe it. 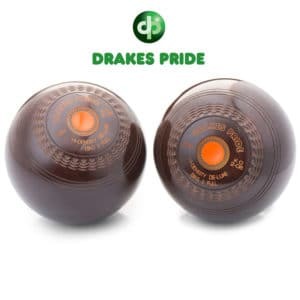 Normal players are not allowed to bowl with the right or left hand at will – the extra few inches of ground so gained would be a big advantage to the player in the Crown Green Game who can play equally well with the right or left hand. There is a penalty attached to the non-observance of this law. On the first occasion the referee should order the bowl to be stopped and played again properly. On a second or subsequent occasion the referee should declare the bowl to be dead. The game is played by two players, each player having two bowls. The object of the game is to get one or both bowls nearer to the jack than either of the opponents’ bowls. The bowls are delivered alternatively until each player has delivered both bowls. The jack, then, is delivered first, and thereafter the players deliver their bowls to the jack. The right to deliver the jack belongs to the player who won the preceding end; the right to deliver the first jack is decided by the spin of a coin. The player throwing the jack in each end is called the leader. On starting the game the leader places the footer within 3 yards of the entrance to the green and 1 yard from the edge of the green. Play commences from this point, and continues over the green in all directions. At the conclusion of the end, the footer should be placed at the back of the jack by the last player. The leader in the succeeding end may, however, remove the footer to any position within a circle of radius one yard, taking the jack as the centre of the circle. If he moves the footer he must do so before throwing the jack for the next end. The footer must remain in position throughout the game. If it is taken up after playing a bowl, and that bowl has to be replayed, then the footer must be replaced as near to its former position as possible. Throughout the game each player must continue to use the jack and the bowls with which he started, except by permission of the referee. The number of points to be scored to make a game is mutually agreed by the players before play starts. The winner of each end scores one point for each of his bowls which, when both players have delivered their bowls and the bowls have come to rest, lies nearer to the jack than his opponent’s nearest bowl. When the result is in doubt and it is necessary to measure distances between the jack and the bowls, the loose end of the measuring pegs must be taken to the jack. The winner of the end, and only he, signals the result to the scorers. To settle any dispute not provided for in the Laws of the Game. To insist on adherence to the Laws of the Game, without waiting for each player to register an objection. To give decisions when the players cannot agree. Under certain circumstances, to remove a bowl so that measuring can be carried out. The decision of the referee on any point is final. The jack has come to rest not less than 21 yards from the footer (centre of footer to centre of jack). The jack has not been bowled so as to come to rest within 3 yards from the centre of the green. The jack has not come to rest within 4 yards of the edge of the green if the footer is also within 4 yards of the same edge. The jack has not gone off the green. If the leader fails to set a mark with his shot, his opponent then attempts to set a mark, using the same jack. The opponent is not allowed to play first at the jack. If the opponent fails to set a mark then the original leader has a further trial. The alternate trials continue until a mark has been set, but whoever finally sets it, the original leader plays the first bowl at it. If a player wishes to make objection to a mark he must raise his hand as a signal to the referee. There is no set form of words for questioning the legitimacy of a mark – any remark which suggests that a mark has not been set is regarded as an objection. Any objection to a mark must be made before the first bowl is played. The leader may, if he wishes, play his first bowl before the objection is settled without incurring any penalty. Should his bowl displace the jack the measurement is made from the centre of the footer to the centre of the jack in its new position; if the jack has not been displaced the measurement is made to the centre of the jack in its undisturbed position. If the measurement proves that a mark has been set the leader still has the choice of accepting the mark or having the jack and bowl returned to him to set another mark. On the other hand, if the leader questions a mark set by his opponent, neither player is allowed to deliver a bowl until the objection has been settled. If the measurement proves that a mark has been set, the decisions must be accepted and the leader must start to bowl to it. In these circumstances the leader is not allowed to set a new mark. Any objection to a mark must be settled by measurement – a tape or other certified measure, at least 21 yards long, must be used. The winner of an end, in addition to increasing his score, gains an advantage in the succeeding end in that he delivers the jack. By doing so, he gets a preliminary “feel” of the green and, of course, can choose which bias, left or right, he gives to the jack. In fairness to his opponent he must not bowl the jack without allowing his opponent. To see which bias he gives to the jack. To watch the course of the jack from a point near the footer. Having observed these rules he is not compelled to tell his opponent which bias he has give the jack. The original position of the footer if half the bowls have not been played. A point one yard from the edge of the green nearest to where the jack was struck off if half the bowls have been played. There are often several games taking place simultaneously on the green. As each game proceeds criss-cross over the green it is inevitable that some interference takes place. Provision is made for such happenings in the rules, and, in general, no penalty is incurred. It stops on the land of the other players, i.e, is in the direct path of the bowls of another game. If two jacks from different games are bowled near the same place, the last one to come to rest must be pronounced not a mark and returned to the players. The jack is displaced by an exterior cause, and the players are unable to agree to which spot it should be replaced. Any person on the green. Note that if a player strikes the jack with his bowl and the jack comes in contact with his other bowl, or with either of the opponent’s bowls, it must remain at the place to which it was disturbed and the end continued. A player must bowl with the same hand throughout the game. If he first delivered the jack with his right hand, he must delivery his bowls with his right hand, with his right toes on the footer. Similarly, if he first delivered the jack with his left hand, he must continue to bowl with his left hand, his left toes on the footer. Each player can retain possession of the footer until his bowl has ceased running. If the leader, for instance, sets a mark with his first delivery of the jack he maintains possession of the footer until his first bowl has ceased running; but he must not deliver his bowl until the jack has come to rest. Many players complete their delivery by following up the bowl. If the opponent should then take possession of the footer, he must wait until the bowl has stopped running before delivering his own bowl. It travels less than 3 yards from the footer. It is played or struck off the green. It falls out of the player’s hand, even by accident, and runs so far that it cannot be recovered without quitting the footer. It is placed, not played. If a player delivers an opponent’s bowl by mistake. A bowl that becomes dead must be taken out of play immediately. If a running bowl is impeded, other than by the player himself, it must be played again. Should this be the leader’s first bowl he may, at his discretion, have the jack returned to him to set another mark. If the player impedes his own bowl it becomes dead and is taken out of play. This rule does not prohibit a player’s bowl striking the jack or any of the bowls which have been delivered in that end. If a mark has been set, but the leader cannot deliver his first bowl because a tape is on the green while a mark in another game is measured, he may have the jack returned and set another mark. When it is seen that a running jack or bowl is likely to strike a still bowl or jack in another game, the running jack or bowl should be stopped, returned and replayed. After delivering a bowl the player must not approach nearer than 3 yards to it before it stops running. If he follows it across the green he must give his opponent an uninterrupted view of the bowl in its course. At no time must he attempt to speed it up or slow it down during its progress. On the first occasion the player is cautioned. On the second occasion two points are awarded to his opponent. On the third occasion his bowls are removed from the green and the game awarded to his opponent. If a player is standing at the end where the jack rests, he must stand outside the radius of the bowls that have been played, and away from the jack so that he does not obstruct the view of his opponent. A bowl played out of turn must be returned and played again in its proper turn. If a player delivers an opponent’s bowl, by mistake or deliberately, it becomes a dead bowl to that player and he loses one of his bowls as a penalty. The bowl that was played is returned to the opponent to be played again by its proper owner. Should a wrongly played bowl disturb the jack or a bowl that has been played, then the disturbed bowl should be replaced as nearly as possible to its original position. Should a player touch or displace a still bowl of his own then that bowl must be taken out of play. If a still bowl is disturbed by an opponent or any other person it must be replaced as nearly as possible to its original position. Similar action is taken if a still bowl is disturbed by a jack or a bowl from another game. Both players must be careful when counting the score at the conclusion of the end. Neither jack nor bowls can be moved until the leader and his opponent are agreed on the result, otherwise the opponent can claim a point for each of his bowls in play. If it should be necessary, as often happens, to measure the distance between the jack and two or more bowls, care must be taken not to disturb the jack and the bowls. Should a player disturb a jack or a bowl while measuring is taking place he loses the point he is claiming. Sometimes a bowl rests on another one, or on the jack, and the measurement cannot be completed without removing the obstructing bowl. Such removals should always be made by the referee, and if the remaining bowl should move its position when the supporting bowl is removed, the player must accept its new position. Once a game has commenced it should be played to its finish. A player may temporarily leave the green having informed his opponent and obtained permission of the referee; should he fail to obtain that permission he forfeits the game. If bad light or the weather causes an interruption or postponement of the game, the points scored by each player will continue to count. The position of the jack on the green should be marked so that the game may be resumed from its interrupted point. Appeals against the light or the weather should be made to the referee. Unfair play or ungentlemanly conduct should be punished severely by the referee. His decision on such matters is final; on the first occasion he may caution the player concerned or order him to retire from the green; on the second occasion he will certainly send him off the green. It follows that the player so punished will forfeit the game, although his score at that stage of the game is allowed to count. Players should note that wilful breaches of the Laws of the Game should be similarly punished. Good behaviour is expected of spectators. They must not instruct the players or give any intimation to them once the game has started. They are not allowed on the green, and if they should encroach on the green, the players or the referee should order them off the green. The only persons allowed on the green are the players, the referee and the measurers when their services are required. A similar law governs the behaviour of players in one game vis-a-vis players in another game. Players in one game may not give advice, instruction or any intimation to players in another game. If a bowler sends the Jack and the Jack goes off but he has sent his bowl, he loses the bowl but who sends the next bowl is it the second player or the player who lost his bowl.? The simple answer is Yes. Provided you have shown your opponent the correct bias that you delivered the jack. No reason to enlighten your opponent on how you intend to deliver your first bowl. When playing pairs, what is the rule that applies if you bowl your partner’s bowl by mistake.